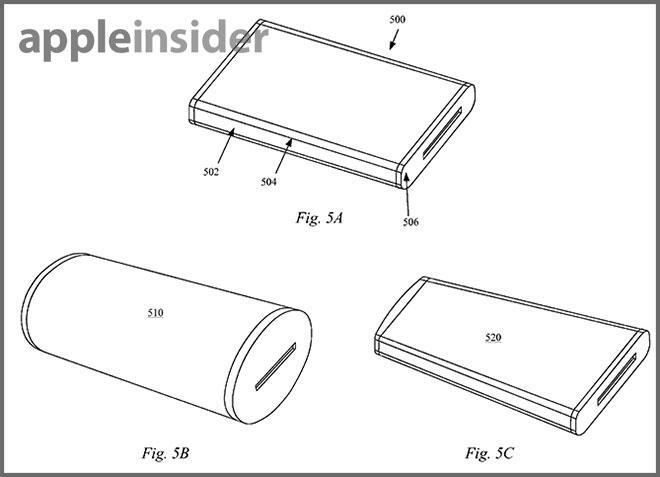 In a patent filing published by the U.S. Patent and Trademark Office on Thursday, Apple describes a futuristic portable device complete with wrap-around AMOLED display, all-glass construction and face tracking. 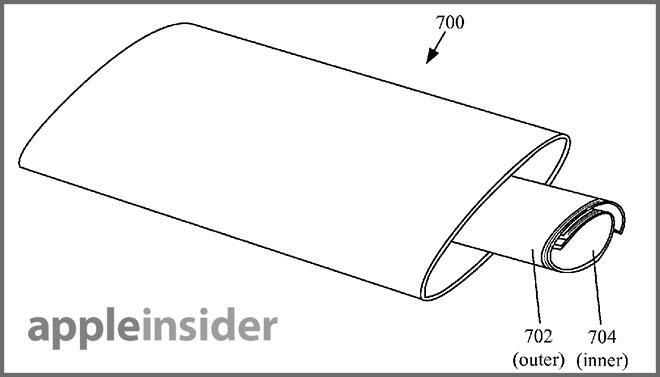 With its application for an "Electronic device with wrap around display," Apple looks to create a portable with the most screen real estate possible by using a foldable AMOLED display that is "unrolled" into a transparent structure. The invention notes traditional handsets and tablets take on a planar form factor that, while aesthetically pleasing and easy to handle, don't use a vast amount of surface area provided in their designs. Proposed is a curved display that wraps around a majority or entirety of a device, thereby allowing for the most screen space to be utilized. Also included are specifications for cutting-edge technology like facial recognition and multiple flexible transparent displays layered on top of each other to mimic 3D screens. The star of the device is its wrap-around display, which is fitted into the transparent chassis by folding, inserting, and unfolding or "unrolling." In one embodiment, the filing calls for a flexible display to be folded so that a continuous band is formed, on which various graphical assets like photos and video can be shown. By orienting the screen in such a manner, the invention is able to show a much broader set of graphics when compared to a smartphone. Bottom view of device with display and internal components. As is the case with many modern portables, the display is not only a means of content consumption, but also serves as the main user interface. Indeed, some embodiments of the filing require the screen to be the means of input as no other buttons or switches are present. Gestures are used instead, replacing volume and hold buttons, allowing for a seamless glass design. The invention states glass or other suitable transparent material can be used to provide a stable structure for the device housing, not only allowing for maximum access to the screen, but also for high aesthetic value. In some embodiments, the enclosure is seamless, though variations can be bead-blasted or covered in ink to hide unsightly internal elements from the user. A glass tube is called for in one iteration, with the patent filing making special note of the radio transparency of glass, which is key to internal wireless communications equipment. Alternatively, metal columns or other structures can be disposed throughout the chassis to provide extra support. While the external cross section can take on the form of a tube, the inner structure of the housing can be widely varied, from a rectangular to pill-shaped. End caps are fastened to one or both sides of the housing, though in some embodiments, these caps can be removed so that two devices can be connected together to create a larger system. Various embodiments of the invention. Because the screen wraps entirely around the device, it is necessary to have a user detection system that can determine how a user is interacting with the unit. To solve the problem, the user is tracked through facial recognition by on-board cameras, with the system outputting visuals on the display based on approximate field of view. Finally, the device can include multiple transparent displays that are overlaid on top of one another, cooperatively presenting content. For example, one display can show the same content as a second display, but slightly out of sync to give the illusion of 3D imagery. In another example, the second display can simply present a different set of visuals than the first. Illustration of multiple displays overlaid atop one another. 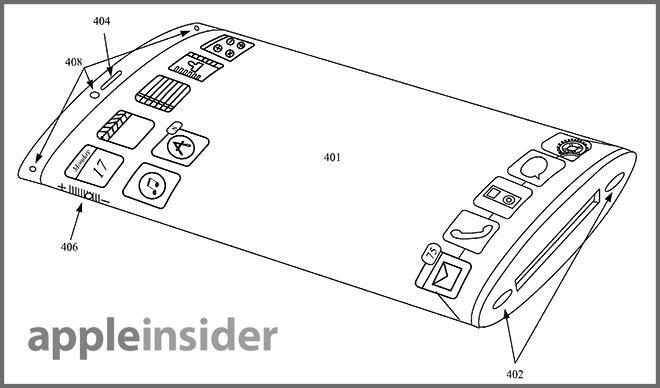 Apple's patent application for a device with wrap-around display was first filed for in 2011 and credits Scott A. Myers as its inventor.